Kris Kobach will never forget to use a cover sheet again. On Sunday, Kansas’s secretary of State arrived for a meeting with Donald Trump at his New Jersey golf club carrying a folder with a document on top. The paper was visible to assembled reporters and photographers, one of whom snapped the above shot. Zoom in and it looks like this. 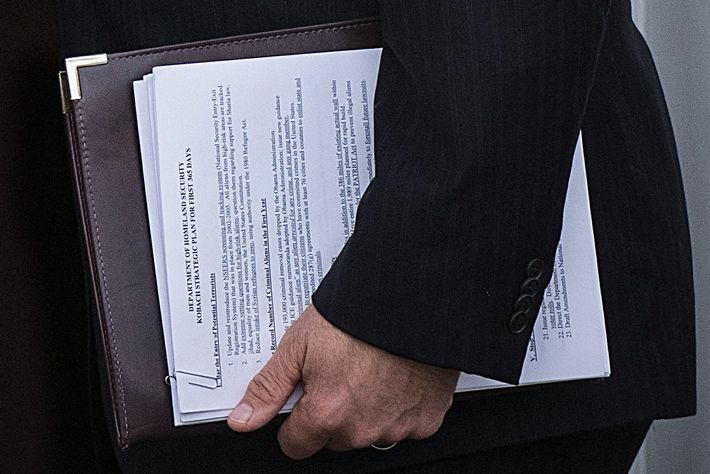 Turn your monitor 90 degrees and you’ll see that the the document is Kobach’s “strategic plan for [the] first 365 days” of the Department of Homeland Security. 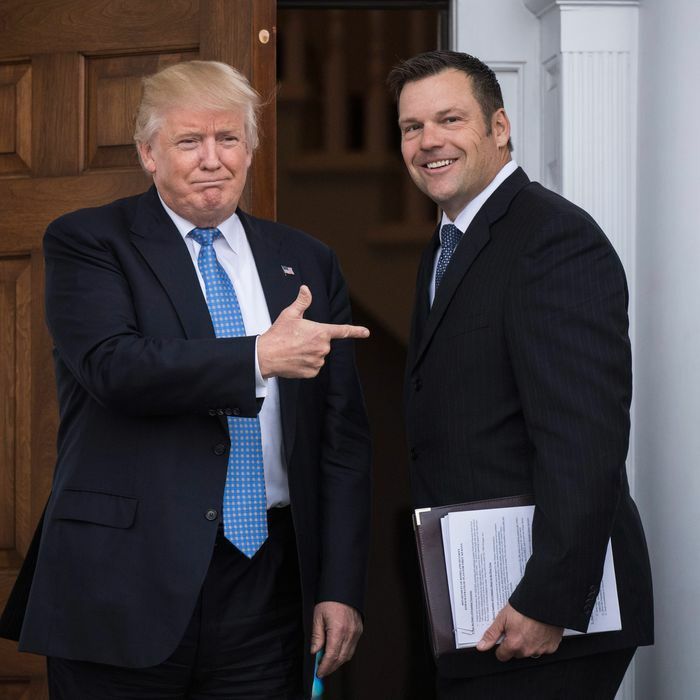 It lends credence to speculation that Kobach, the author of Arizona’s SB 1070, known as the “papers please” law, could serve as head of DHS and provides some insight into what he might do in that position. The numbered document begins with a section entitled, “Bar the Entry of Potential Terrorists” and calls for the reinstitution of the National Security Entry-Exit Registration System. Enacted in the aftermath of 9/11, the system required men 16 and older from 25 different countries, 24 of which are majority Muslim, to register with the government upon entering the United States. By the time the Obama administration de-listed the 25 countries in 2011, effectively ending the program, it hadn’t led to the conviction of a single terrorist. Still, the program remains law and could be jump-restarted by the Trump administration. Kobach’s document also calls for ending Syrian immigration to the U.S. and details what “extreme vetting questions” for “high-risk aliens” would look like. “Question them regarding support for Sharia law, jihad, equality of men and women, and the United States Constitution,” the document says. The rest of the document, which is obscured by Kobach’s arm and hand, deals with “criminal aliens,” the proposed wall on the Mexican border, and voting laws.